Questions from serial number 22 to 29 are 5 marks questions. Answer of these questions should not exceed 120 words each. Question number 30 is 5 marks map question with 2 marks from History and 3 marks from Geography. Q.2. Who among the following painted Bharath Mata? Q.5. Who among the following is the founder of the Bahujan Samaj Party? Q.10. Describe the process of German unification. What is meant by civilising mission of the colonisers? Q.11. What is the idea of Satyagraha? Q.12. What were the limitations of Civil Disobedience Movement? Q.13. How do minerals occur in igneous, sedimentary and metamorphic rocks? Q.14. What are the challenges faced by Jute industry? Q.15. Give any three merits of pipeline transportation. Q.16. How do pressure groups and movements exert influence on politics? Q.17. Explain any three challenges faced by political parties in India. Q.18. Give three arguments to prove that democracy is the best political system. Q.19. Why do we need to expand formal sources of credit in India? Q.20. Which factors have enabled and stimulated the globalisation process? Q.21. Explain any three rights of the consumers? Q.22. Explain the factors which led to the development of a sense of collective belonging to different groups of people in India? Q.23. What role did language play in developing nationalist sentiments in Europe? OR What was the impact of the Great Depression of 1930s on Vietnam? Q.24. Explain the different methods of mineral conservation. Q.25. How do industries pollute the Environment? Give suggestions to control industrial pollution. Q.26. Compare and contrast the popular struggles in Nepal and Bolivia? Q.27. What are the different functions of political parties? Q.28. "The impact of globalisation has not been uniform "Do you agree with the statement? Explain your answer. Q.29. What problem do we face in taking the consumer movement forward? Q.30. 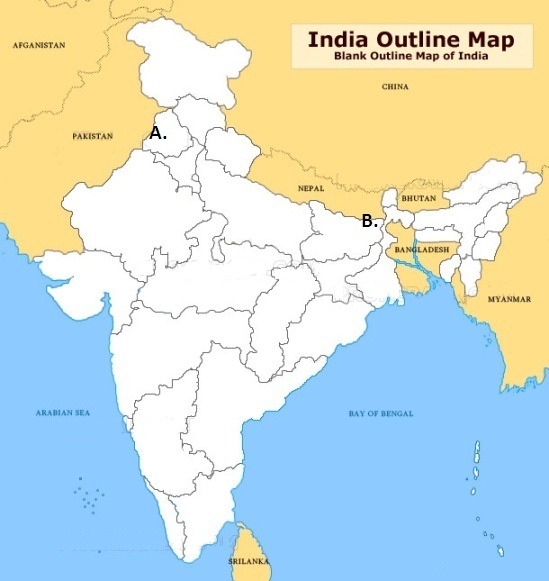 (I) Two features are marked in the given political outline map of India. Identify these features with the help of the following information and write their correct names on the lines marked in the map. (a) The place where the Indian National Congress session was held in 1927. Locate and label the following items with appropriate symbols on the same map. Q.30. (II) Three features A, B, C are marked on the given political outline map of India. Identify these features with the help of the following information and write their correct names on the lines marked in the map. Locate and label the following items with appropriate symbols and writ their correct names on the same map. a. Effort of the middle class to unite Germany. It was suppressed. b. Prussia's chief minister Otto van Bismarck takes the leadership for unification. c .Three wars over 7 years with Austria ,Denmark and France. Prussia won. d .Prussian king William I was proclaimed as the king. Ans A .European conviction that they had the duty to civilise the natives. B .Education was the way to civilise them. c. The French needed an educated labour force to consolidate their power. a .A novel method of agitation which emphasised the power of truth. b .Physical force is not necessary to fight the oppressor if the cause is true. c .A satyagrahi can win the battle through non voilance. d. The oppressor should be forced to see the truth. a.All social groups were not moved by the concept swaraj. b. Dalits or untouchables were not involved. d. There was an atmosphere of suspicion and distrust between communities. a. Minerals occur in igneous and metamorphic rocks in cracks or faults. a. Stiff competition in the international market. b. They organise protest activities. b. It enhances the dignity of citizens. b. There is no agency to supervise the activities of the informal sources of credit. c. Electronic inventions of computers and internet. e. Severe suppression of the revolts. e. Postponing the opening of mines to a future date. a. In Nepal, the popular struggle was for the establishment of democracy. b. In Bolivia it was a struggle within democracy and it was against a wrong decision of the government. c. In both cases, large scale people's participation was ensured. e. In both the cases, political parties and pressure groups played an important role. b. Certain groups and sectors were hard hit. d. Even though many industries came up, many small manufacturers have lost their grip.